Everyone with a 1996 or newer car needs this tool! IT WILL SAVE YOU MONEY!! This tool works with Every Make, Every Model, Foreign or Domestic! There are basically 3 things you need to record diagnostic data and clear diagnostic trouble codes ( DTC's ) and turn off the check engine light from an OBDII based system on your 1996 and newer car. 1 - A PC computer, a Pocket PC PDA, or PalmOS to look at the OBD data. 2 - The OBD2 All-In-One scan tool to interface your PC or handheld computer to the OBDII diagnostic port on your car. 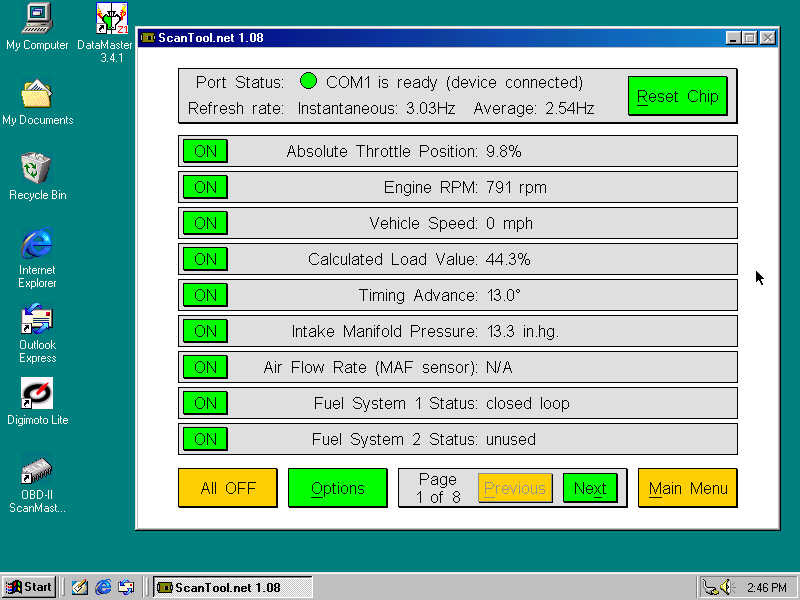 3 - A software program running on your computer to capture the OBD data. What is the reason for having the above setup for yourself? Mainly, you now have a powerful tool to analyze your cars On Board Diagnostic ( OBD ) data yourself, better even than the specialized scanning tools only dealerships and big automotive repair shops had in the distant past. With your own setup, if your check engine light or Service Engine Soon light (SES light) comes on you can look at detailed OBD data for yourself to see what trouble codes have been set and the conditions they were set under, and then clear that trouble code and turn off the Service Engine Soon or Check Engine Light. This will save you money in repair costs by knowing what is or isn't wrong with your car in many cases, and avoid costly trips to the dealership or repair shop. Clearing the check engine light and engine codes must be done in order to pass a smog test or emissions test. For many, it is quite interesting to be able to see your car's sensor systems working in real time, and even having the potential to upgrade performance through PROM reprogramming of your cars PCM or ECU. Let's look at the OBD-2 scan tool first, since we sell low cost OBD-II scan tools. It will probably be the only thing you will need to buy to do your own diagnostics and clear your trouble codes, which turns off the check engine light. If your 1996 or newer car is OBD II compliant (or European OBD, EOBD, or Japan OBD, JODB) you will see the above style 16 pin connector, called a J1962 connector. Some 1994-95 GM cars have the 16 pin OBD 2 connector shown above (Corvette's, Camaro's, and LT1 cars among them), however, even though it is an OBD-II connector, it has an OBD1 system behind it on these 94-95 cars. If you have a 94 or 95 GM car with the 16 pin connector, we sell 16 pin connector diagnostic cables for it here. Some 1994 and 1995 cars are fully OBD2 compliant and our OBD 2 allinone scan tool and code reader will work fine on these vehicles. Check under your hood for an OBDII compliance sticker on the 95 and 94 cars. If you have a GM OBD1 system which has a 12 pin ALDL OBDI connector as pictured below, we sell data logging cables for those as well. Make sure you buy the correct diagnostic cable setup for your car or cars! You will need a computer to run your scanning or diagnostic software, preferably a laptop PC (there are programs available for almost any PalmOS and Pocket PC PDA also). The hardware requirements for the PC are largely dictated by what scanning or diagnostic software you plan on running. Some of the scanning programs are very simple DOS based programs, others are more graphically intensive. Look at the software links we have posted and read the hardware requirements for the program you are thinking of using. For the most part, the simple DOS programs can be run on very old, 486 based laptops with very little memory ( <16MB ). 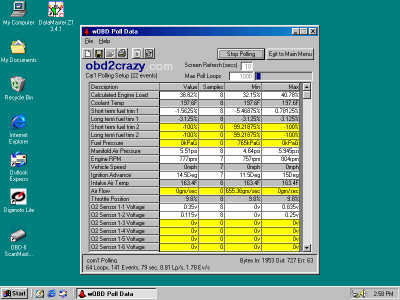 The more advanced graphical scanning programs, such as Scanmaster and OBD2Spy, still have very modest hardware requirements, requiring Windows 98 or newer, a 90Mhz or greater pentium CPU, and 32MB of RAM or greater. If you do not already have a laptop, these are approximately 1996 era laptops and can be had for very little money off of ebay, many times for less than $50. Whatever PC or handheld PDA you end up using, determine if it has a USB or serial interface adapter, or both. Almost all older laptops and PC's come with the serial interface built into the computer itself. 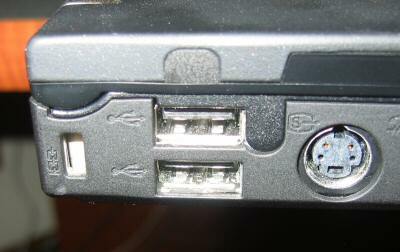 It will be a 9 pin male connector that looks like the connector on left below. 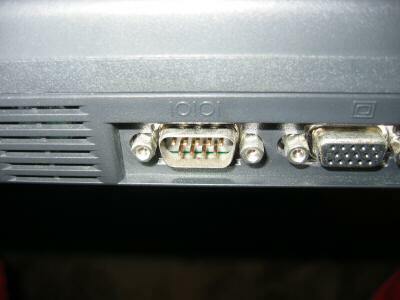 The 15-pin connector on the right below is a video port, not a serial port. 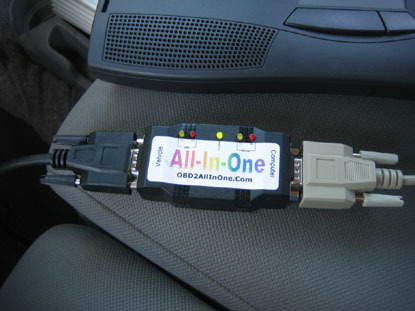 If you have a newer laptop that does not have the 9 pin serial RS-232 interface built in and has a USB only interface, order the OBD2Allinone with USB interface. You can use our serial version OBDII PC scan tool on a USB only PC by adding a USB to Serial converter. You can either buy a USB to serial adapter, or buy a PCMCIA PC card that has a RS-232 serial 9 pin interface. These serial adapters are sold with a disk that contains the software drivers needed to make them work. Buy one that can be returned in case it does not work properly on your computer, especially with the USB adapter. There are reports of compatibility problems with these USB to serial adapters, and they can be tricky to get working properly on certain computers. Ultimately it is easier to order the OBD2Allinone with USB interface. The last item needed is the diagnostic software that will run on your PC or handheld to collect and record the data from your OBD-II system. There are a number of excellent software packages available, with some of them being free and others giving you a trial or demo mode. Screen shots and links to each website are provided below for a few of the software packages we have tested and work well with the OBD 2 AllInOne scan tool. We're not endorsing one scanning package over another, as they all have their place and will provide critical data. Below are screen shots of some of the software packages. There are many more screens to all of these packages, we've just included a few for viewing here. 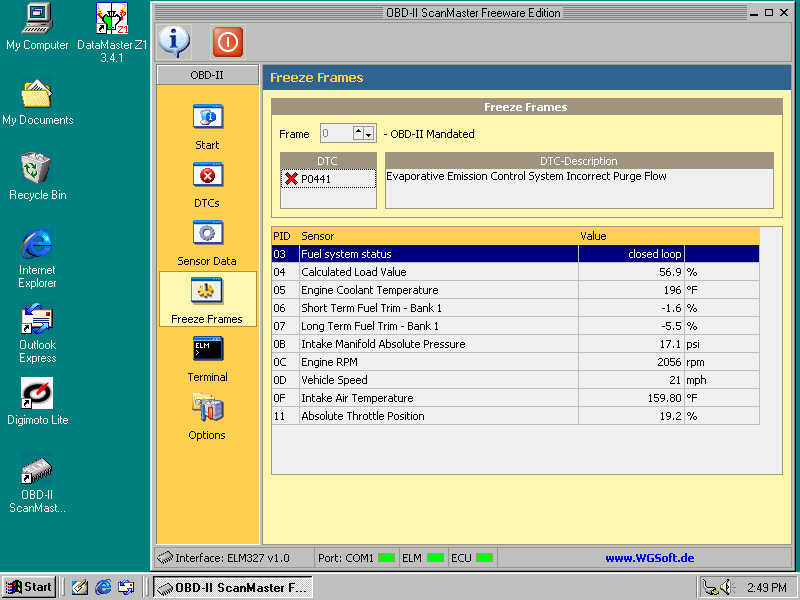 You can click on the image to get a larger view, and clicking on the title link below the picture will take you to the manufacturers website for each of these OBD-II packages. 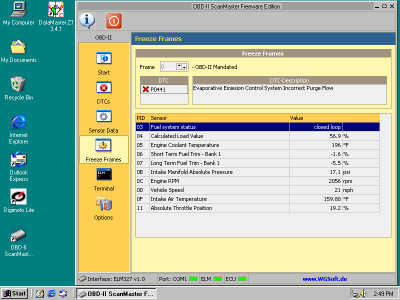 We provide a software CD with all OBD2Allinone units. We have found that all of the above packages are free downloads that work with our OBD 2 Allinone scan tool, with all protocols: ISO, VPW, PWM, KWP2000 and CAN (The free Scanmaster version does not currently work with CAN). Read the documentation for the particular software package you are using for more detail. 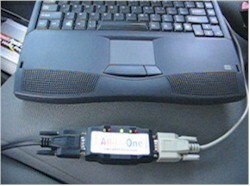 The OBD2 AllInOne scan tool is built using the ELM327 processor chip, for which many software packages have been written. This chip is used by a number of manufacturers and as time goes on, more and more software packages will be developed for it. This will ensure a variety of packages readily available to everyone, with more and better features in future versions. The OBD2 AllInOne scan tool is able to operate at 2 different communication speeds that are user selectable, to insure compatibility with existing and future software packages. (Click the image at the right to view a short video.) In car operation is fairly straight forward. Ideally it takes just a few steps: plug the OBD-2 cable connector into your OBD port under the dash and then plug the other end into our OBD2 All-In-One unit. The power light for the OBD2 All-In-One unit will then come on. Then plug the provided serial or USB cable into the other end of the OBD2 All-In-One unit and then the 9 pin RS-232 serial port or usb connector into your laptop. Have your PC turned on and start whatever data collection software you have downloaded, and turn the car key forward to start the communication between your cars ECU/PCM and the PC. You can view your cars sensor data, read diagnostic trouble codes if any are set, and clear the diagnostic trouble codes. Some packages provide freeze frame data, which is all the cars sensor data at the time a particular trouble code was set. Some packages allow data logging for viewing later on with extensive color graphing capabilities. 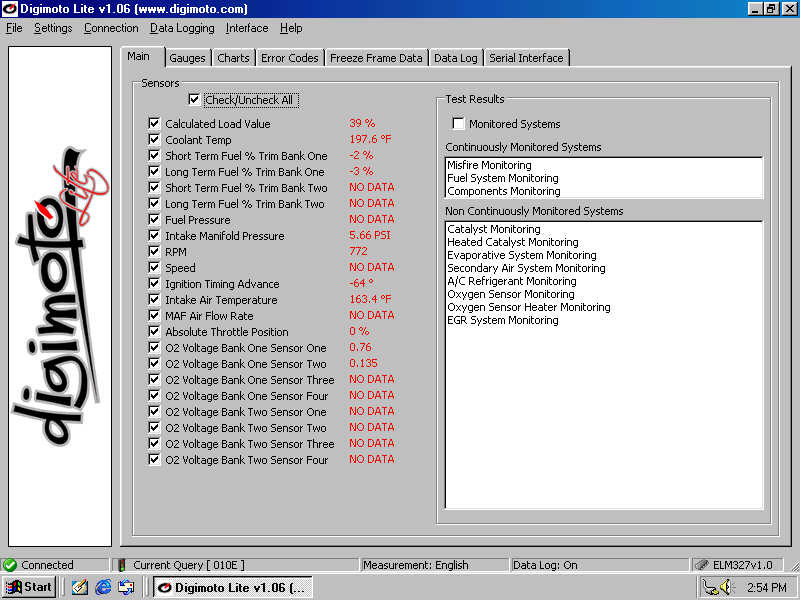 Other packages have built in dynomometer calculations so you can in effect have your own chassis dyno. We have found in car operation to be more reliable by using a DC to AC inverter to power our laptop while doing data collection runs. We purchased a small Coleman 400 watt inverter at a Costco or Sam's club type store for $20 and it works great. We didn't have to worry about the battery on the laptop discharging, and we could leave the laptop running for hours, even with the car turned off while we were taking a break. A good thing is you can just pause your data gathering session during this time and start it again when you are ready. 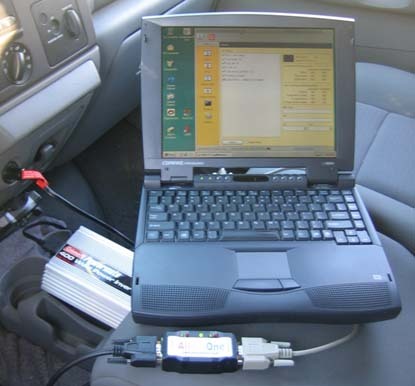 The amount of information available about on board diagnostic systems and their operation is quite large, and much reading can be found on the internet. For support, the various internet forums and manufactures sites can be great places to find information about your particular car or setup. Included below are some links to other OBDII scan tool manufacturers, many OBD-2 software packages, and various links we have found to be useful. Once you have seen how your car's data looks, some people will want to upgrade or change their ECU/PCM parameters by either buying an upgraded ECU or PCM calibration, or by doing their own custom ECU calibrations. Be aware that you can seriously damage your car by loading the wrong parameters into your ECU/PCM. Study up on chip upgrades very carefully before even beginning to consider doing it for yourself.